Scheduler: 'Function unsupported please re-start'? This is causing serious problems as our scheduler tasks are not competed and iok files not refreshed. Can someone please support us on this? FYI on the same server, but with another user we also run 2.9 b779. We are currently investigating the issue and we will contact you tomorrow to discuss this issue further. You can contact me today about this very urgent issue. Arjan is on the road today. I'll send you an email with my skype details. Schedulers are not stable at the moment. This is causing serious issues again. Please contact us ASAP. Paola already knows about this new problem. We have created a build with a fix and extended diagnostics for running multiple schedulers. 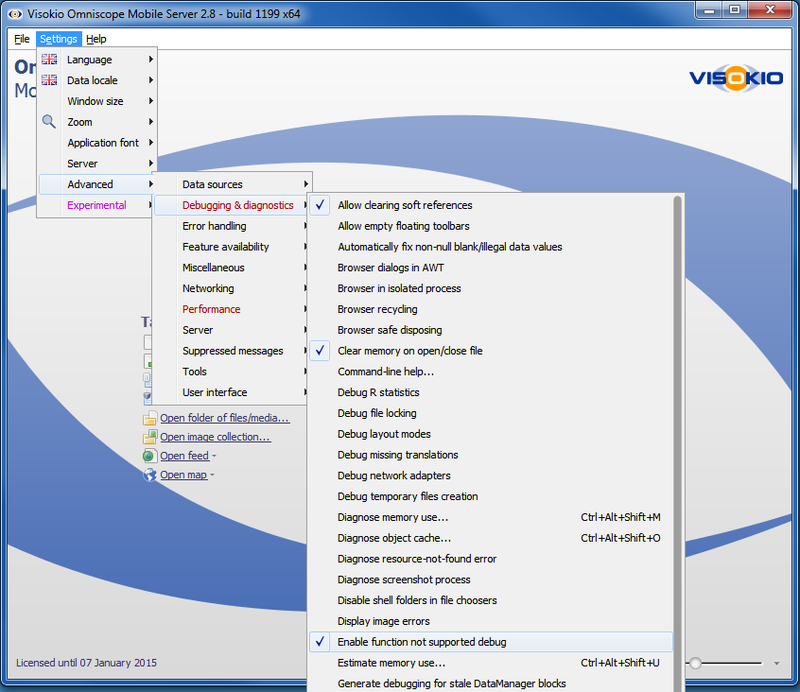 It is available for download now, daily builds, Omniscope 2.8 b1199 23rd of January 2014. Install the version above or later. 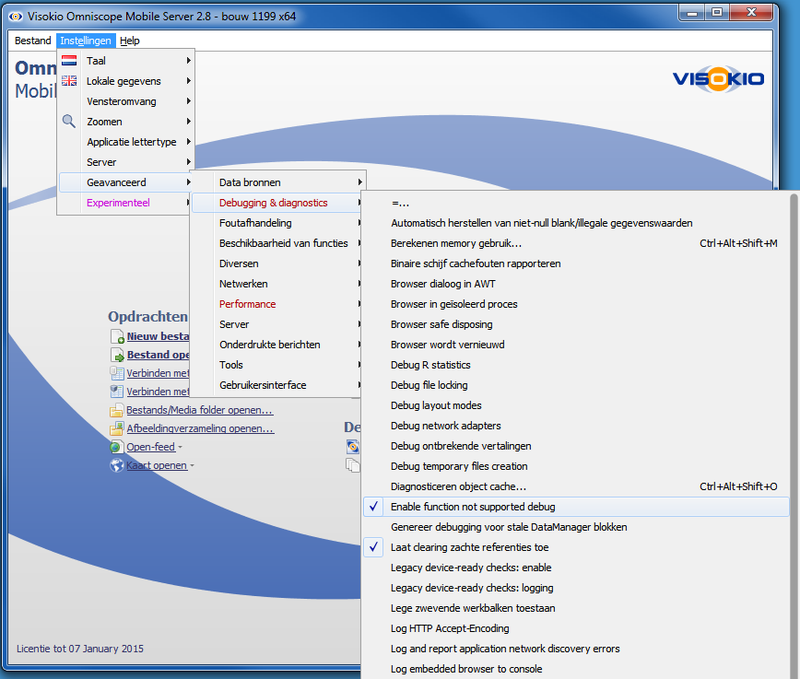 Open Omniscope on the Desktop and "Enable function not supported debug", Select Settings -> Advanced->Debugging & Diagnostics, check "Enable function not supported debug". Separate the log for each of your schedulers. In the batch file you use to start schedulers modify or add the paramater -DserverLogFilename to the java.exe command line you use. If you do not experience the problem again over the next couple of days you can switch off the "Enable function not supported debug", repeat the above process and uncheck "Enable function not supported debug". With the new builds of 2.8 and 2.9 running problemfree since friday morning, this problem seems to be resolved. This problem is occuring again and is showing up all of the time on random processes. Could you check if the fix is still working? Which Omniscope build version number are you experiencing the problem with ? Will check with the developers that the fix is still in place. Can you restart the schedulers ? How quickly does the error start to appear ? Restarting did not solve the issue. Have you had any luck with the custom build we sent last week? Thank you for all the help and valuable testing you are carrying out for us to help diagnose the issue. One of my colleagues will be in touch later on today in regards to this.